A political activist has declared that the charge of unlawful assembly ‘slapped’ on National Democratic Congress (NDC) leader Chishimba Kambwili is a case of pure abuse of state authority and power by the executive. McDonald Chipenzi who is also former Executive Director of the Foundation for Democratic Process FODEP, says Bottom of Formit is unfortunate that the government was using state power to frustrate and stifle the voice of its opponents. 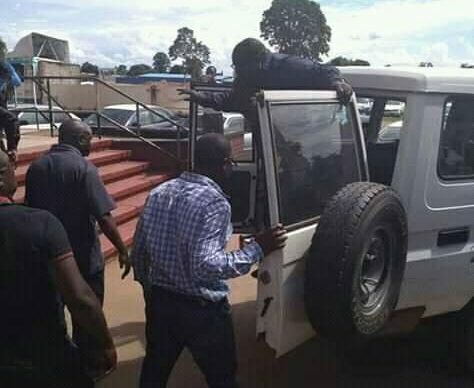 Speaking in an article posted on his Facebook page last night, Chipenzi said it was amazing to hear that Roan PF MP had been charged with unlawful assembly when there is a standing ruling from the National Assembly of Zambia Speaker, Dr. Patrick Matibini advising the police to allow MPs to hold meetings in their constituencies. “Unless the executive is disregarding the legislature, the police action on Chishimba Kambwili is pure impunity and disorder. Just to refresh the police and those who may have short memories, on 2nd July, 2015 the Speaker ruled on a point of order raised by then Mwinilunga UPND MP Stephen Katuka that police should allow MPS to hold meetings in their constituencies,” he said. He explained that Dr. Matibini said the parliamentarians did not require any police permit but police notification of their presence in an area they intend to address their constituency and that the police were in breach of the privileges accorded to parliamentarians to visit their constituencies. “The Speaker noted that parliament was concerned to learn that Mr. Katuka was hindered from addressing his constituents on account that he did not give the police seven days notice. With the above recap from the National Assembly, where did the police get the guts to charge an MP who addresses his electorates in his constituency unlawful Assembly” ? Chipenzi who is the Governance, Elections Advocacy Research Services (GEARS) executive director said it appeared the executive was merely trying to undermine the dialogue and reconciliation process that was in the process of taking precedence. The NDC leader was detained yesterday pending a court appearance this morning at 09:00hrs However, he has been taken back to the cells pending a court appearance at 14;00hrs today. Journalists and family members were this morning denied access to the courts.